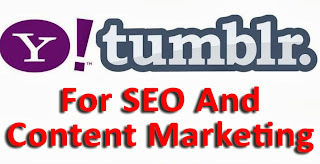 What Are The SEO Benefits of Using Tumblr For Content Marketing? Tumblr is one of the many social networks out there. But it's not just another social media network. Many people underestimate the usefulness of Tumblr, even though it has huge potential for SEO and social media marketing. Tumblr is quickly growing in popularity. But still many people are unaware of its benefits. So, in this post let's talk a bit about Tumblr, how it works and how to get started using Tumblr for online marketing. And most importantly, what are the SEO benefits of using Tumblr? Tumblr is a blogging and social networking platform that hosts more than 131 million blogs and is among the top 15 websites in the United States. Tumblr was founded by David Karp and currently owned by Yahoo. Tumblr lets you effortlessly share anything. Post text, photos, quotes, links, music, and videos from your browser, phone, desktop, email or wherever you happen to be. You can customize everything, from colors to your theme's HTML. Tumblr includes both blogging (and microblogging) and social networking features. Tumblr has all the blogging functionality of a blog platform such as WordPress, blogger, etc. Tumblr also include all the social networking features of a social network site such as Facebook or Twitter. This makes Tumblr a unique platform. Why Tumblr is a big deal? More than 131 million blogs as of 20th September. Tumblr is among the top 15 websites in U.S.
More 50% of Tumblr users are under the age of 25. Many people are switching to Tumblr (most of them are teens). Tumblr has unique 300 million monthly visitors. By 2011 Tumblr had three times more blogs than WordPress. Today Tumblr is the largest hosted blog platform on the web having 300 million blogs. And a large number of world’s largest, leading brands have presence on Tumblr. Tumblr also has a huge potential for SEO and social media marketing .With user numbers and popularity on the rise, it’s a perfect marketing tool for businesses. You are aware that impressions do matter. Tumblr allows you to customize your page. Choose your layout style and find a design that matches your page’s theme. A variety of themes are available. Choose the one that fits your business. Most blog software creates allows you to create a link to yourself when you comment on a blog post. Links bring traffic to your site when they click the link, but each link can also count as a “vote” for your site with search engines. These backlinks increase your page rank and help your site rank closer to first in search engine results. Dofollow blogs create normal links that count as a vote for your site. Tumblr offers you a Dofollow backlink for each link you share, which is the biggest advantage. Unlike Facebook or other social media, sharing on Tumblr can actually do you good outside of that social media, and aside from bringing you traffic, it will also help you increase your PageRank. Tumblr features a unique tagging system. If you want to add a tag, simply start typing a word and Tumblr will suggest you the relevant tags. Unlike Facebook, Tumblr tags are already used for content discovery. Thus by using relevant tags, there is a good chance of your content to be discovered. You can use Tumblr to quickly set up simple, easy to manage and free microsites (Now called as Simple Sites). You can even use your own domain name with these microsites. Microsites can also be used for redirection to your main website. By building a sleek microsite with quality content would increase your page rank within months. Tumblr is an excellent platform for promoting your brands. With Tumblr becoming more and more popular, it’s a perfect marketing tool for businesses that are trying to extend their reach. With more than 300 million unique users, you can easily promote your brand. By posting quality content, you will have a strong online presence on Tumblr. You might have heard that “the best marketing strategy online is to Be Everywhere” - Pat Flynn.